Today we were very fortunate to have out the Powell Family which is based out of Austin, TX. There boys decided it would be a great fathers day present to take day dad to South Florida for Peacock bass fishing. Dad and the whole family were pretty excited about catching them, ever since they were in Hawaii several years ago and got a sample of the hard fighting Peacock. So, as a family they all decided Florida would be a great fishing vacation and a good place to catch more peacock bass at an affordable cost. By the time they booked the trip, there ended up being four of them. The two boys and Mom and dad. Capt Brett and myself met them at the tackle shop and transported everyone to our first location for some Peacock bass fun. To our surprise the fishing started out slow, the water had risen from resent rains and the runoff created dirty water throughout the fishery. move. From our past experience, the fishing does not get much better in these conditions and this family only had one day. So we needed to make some major changes. Off we went in to the jungle of South Miami, in and out of lakes and canals till we settle on a old spot we both had fished several times before in this situation. A motto of ours is, “A great guide, is a guide that makes a good day, out of a very bad day of fishing.” We felt like we accomplished exactly that on this day! It’s safe to say, this was the right move on this day. Between the both boats we boated over 60 Florida Peacock bass with some real quality ones coming late in the day. 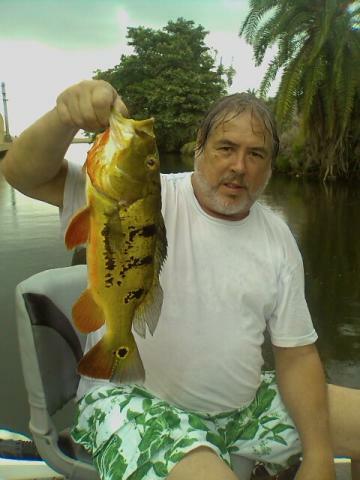 It was “dad’s day” as he boated over 20 peacock bass by himself with several of them over 4 pounds. But, it was Mom that took the wind out of everyones sails by boating late in the day a Peacock bass weighing nearly 7 lbs. All in all, it was a great day for the Powell family and for us a well. This is a true fishing family, they enjoy and truly know how to get the most out of a day on the water.